For any nation, the culture, traditions and language are very important. Keeping any traditions alive is important for teaching the next generations about a particular or shared past. Traditions are beliefs or behaviors that are passed down from one generation to the next within a certain national group. For children, this is very important to positive emotional development. Traditions help to connect individuals to their family and place of origin, giving them a sense of security and continuity from one year to the next. Often, this includes religious traditions. Religious traditions include holidays, rituals and celebrations. Keeping religious traditions alive helps to maintain a sense of connection to the past, as many religious traditions have been alive for centuries. Some believe that traditions are outdated or reflect a value system that is not applicable in today's world. Cultural identity is the identity or feeling of belonging to a group. It is part of a person's self-conception and self-perception and is related to nationality, ethnicity, religion, social class, generation, locality or any kind of social group that has its own distinct culture. Slovenians in Australia are trying very hard to keep the Slovenian traditions, culture and the language. From the early Slovenian migrants arriving, to recent times, the traditions, religious holidays, customs and language are kept alive. Slovenian language schools were established in all states of Australia, except Northern Territory. Slovenian social, cultural and sports associations were established in all states of Australia, except Northern Territory. Slovenian religious centres were established in New South Wales, Victoria and South Australia, and Slovenian priests regularly visit Queensland, Western Australia and Tasmania. They love to sing, dance, enjoy traditional food and drink, celebrate religious and other holidays, collect traditional items, books, films. And their homes are often decorated with abundance of flowers and fruit trees and bees, as they had them in the old country. Democratic election of the Duke - stating that according to reserach by Dr J. Felicijan in The Genesis of the Contractual Theory and the Installation of the Dukes of Carinthia (Gosposvetsko polje, Koroška), Thomas Jefferson initialled a page in Bodin's Republic, describing the Slovenian ritual of the installation of the Dukes of Carinthia. The American Slovenian, Frank J. Lausche pointed that out in his speech on November 28, 1967 in American Parliament. The enthronement of Carinthian dukes was conducted in the Slovenian language in line with an established ritual. 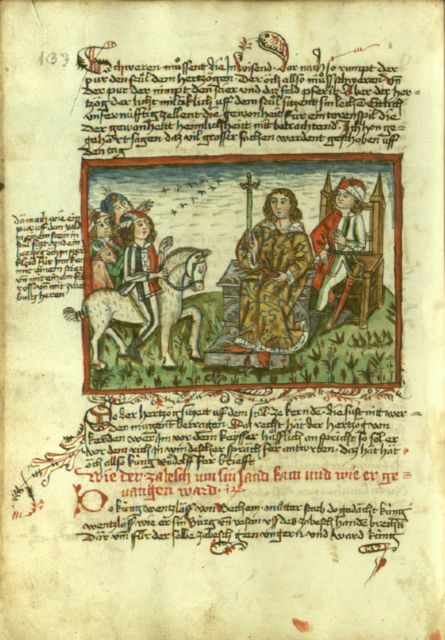 A page from the Manuscript of Clemens Specker, Austrian Chronicle of 95 Estates, 1479 - 1482, considered to be the oldest depiction of this event. © „Burgerbibliothek Bern, Cod. A 45, f. 66v“. (Permission granted September, 2016).